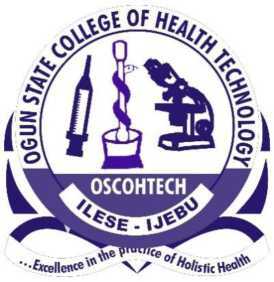 Ogun State College Of Health Technology, OSCOHTECH admission application form for ND and HND programmes for the 2018/2019 academic session is out. Authorities of the Ogun State College Of Health Technology (OSCOHTECH), llese- Ijebu, is inviting suitably candidates to their 2018/2019 academic session National Diploma (ND) and Higher National Diploma (HND) programmes admission exercise. The admission requirements for any of our National Diploma (ND) Programme is a minimum of five (5) credits O/level passes, in English Language, Mathematics, Chemistry, Physic and Biology obtain in WAEC/NECO or NABTEB in not more than two (2) sittings. However, all applicants for National Diploma (ND) programme should also endeavour to obtain JAMB form. Details of each programme requirements are explicitly stated below. Applicants are advised to carefully read the requirements before making their application as error in the choice of course by applicants will not be tolerated. Applicants awaiting results are free to apply. Such applicants should indicate AR in the column for O/Level Results on the Application Form. However, the O/Level Results being awaited must be ready before admission exercise as no student would be considered for admission without O/Level Results. The requirements for admission into Higher National Diploma (HND) programmes includes; National Diploma (ND) not lower than Lower Credit in relevant course/programme in addition to the Good O/Level requirements stated in (1) above. OSCOHTECH – Available Programmes & Requirements. Five (5) ‘O’ Level Credits in English Language, Mathematics, Chemistry, Geography/Biology and one relevant subject at WAEC, NECO or NABTEB in not more than two (2) sittings. Five (5) ‘O’ Level Credits in WAEC, NECO or NABTEB in English Language, Mathematics, Biology, Chemistry and Physics in not more than two (2) sittings. Five (5) ‘O’ Level Credits in English Language, Mathematics, Biology, Geography and Chemistry from WAEC, NECO or NABTEB in not more than two (2) sittings. (A.) Holder of WASCE, SSCE, NECO or GCE O/L with (5) credit at not more than two sittings, which must include English Language, Mathematics, Biology, Chemistry and Physics. Five (5) ‘O’ Level Credits in English Language, Mathematics, Biology, Physics and Chemistry at the SSCE by WAEC, NECO or NABTEB in not more than two (2) sittings. Five (5) ‘O’ Level credits in English Language, Mathematics and Biology and any other two subject from WAEC, NECO or NABTEB in not more than two (2) sitting. (1) Four (4) ‘O’ Level credits in English Language, Biology Mathematics and any other relevant subject. Four (4) ‘O’ Level Credits in English Language, Mathematics, Chemistry and Biology from WAEC, NECO or NABTEB in not more than two (2) sittings. Five (5) ‘O’ Level Credits in English Language, Mathematics, Chemistry, Biology and Physic from WAEC, NECO or NABTEB in not more than two (2) sittings. Five (5) ‘O’ Level Credits in English Language, Mathematics, Biology, Chemistry and Physics from WAEC, NECO or NABTEB in not more than two (2) sittings. How to Apply for OSCOHTECH Admission. 2018/19 Application Form is now on sale at ₦11, 000.00 only. Prospective students are to obtain their forms online after making payment of ₦11, 000.00 only through the POS machine situated at the College Bursary OR via WEB using ATM card (strictly cashless payment). please does it mean that having ND in community health from another school is not eligible to apply for HND in your school?